Welcome to the Download Area, where you can access all your downloads and updates. We hope you find what you are looking for. It is now approaching thirty years since deregulation by global governments started to introduce competition to their energy industries, with customers of all sizes able to choose their provider. With three decades of experience a number of distinct phases are experienced by each market. Competitive energy providers are now studying each other’s markets to identify trends, opportunities and learnings that support their growth. Understanding the phases and future of energy competition is vital as it changes profoundly through digital technology and the insight generated from ever expanding data sources. Energy Suppliers can learn from global markets as they evolve through stages of opening, growth, maturity, revitalization and renewal and apply the insights locally. First in each market there is the initial opening with small volumes and lots of manual effort as companies learn from each other. Over time confidence grows and an accelerated phase of customer selection emerges that opens opportunities for new independent providers to enter the market and take share from the incumbents. Governments often start to intervene to further stimulate competition and keep the momentum going. A renewal stage is created through regulatory interventions to remove competitive barriers or distortions. Additionally, governments may adopt or encourage new technologies that transform the experience of consumers such as smart meters. Eventually markets reach a plateau level of competition appropriate for their size of market and then inevitably with maturity comes some consolidation. Throughout all these phases the forward looking companies are seeking new propositions to enrich the customer experience and/or new markets to expand into. Expansion enables learnings on a global basis and some economies of scale. Along the way some industry changes or technologies may not realise their full potential and governments will then seek to revitalize them with new programmes that create better outcomes for customers. Governments always have to put customer demands before those of the energy industry, after all power stations do not vote them out of office. One thing is clear in all markets, governments and their regulators are focused on the experience of the end customer rather than the sector or infrastructure. Of course there needs to be a balance, but it is the consumers rather than power stations that vote them in and out of office. This means that the energy provider usually known as a Supplier or Retailer has to look out for themselves. In the early stages of their market participation the entry process, cost recovery and systems access are the key focus areas. This evolves with the market to focus on price competitiveness, service quality and ability to support scale. As customer success is achieved then differentiation and automation become vital to the business. At a certain point the customer growth starts to create a new and pressing need: to optimize the business itself. A large customer volume of varying segments creates complexity in forecasting, the accuracy of which determines the level of forward hedging and near delivery trimming needed to reduce imbalance. The ability to underpin a business with the right finance in operational cash flow, trading collateral, customer acquisition and to meet government obligations becomes an all-consuming focus of the business leadership. So it becomes important to have accuracy in the trading, reduce imbalance cost outflows, ensure accurate metering consumption feeds through to correct undisputed bills are all part of the virtuous circle of performance an energy provider requires. Customer growth at any cost will drain cash and reduce return on investment, so optimising both the market position and the customer portfolio in harmony is becoming the next frontier of competitive energy providers globally. Creating an enduring professionalized culture that can grow customer volumes, access and interpret data to drive position optimisation and resource allocation are now integral underpinning to help retailers thrive in the long term. For many years in expanding markets, with opportunity opening through new technologies Suppliers were able to benefit from customer growth but efficiency and careful resource allocation now become key business competitive advantages. Energy Supply is evolving with continual business optimisation for financial efficiency and allocation of expertise to enable continued competitiveness. It used to be said that independent Suppliers with no generation were at a structural disadvantage to the larger incumbent players. However energy markets are now seeing customer take-up of digital technologies such as smart meters control devices in the first wave and smart energy and home control applications in the next. Early adopters also have solar generation on their roof, heat pumps and some have access to community generation projects. As generation becomes smaller, more distributed and connected digitally, each consumer will become their own combination of generation and demand. Suppliers who can access and integrate these in-premise assets to save the customer money overall will suddenly find they have a generation output for the first time. Digital connectivity will drive ever faster, dynamic markets that settle more quickly and at a greater level of granularity to a day. If they can extend the emerging optimisation of their businesses at a financial and customer level into the trading, balancing and settlement areas, they will create a new era of integrated provider once more. Creating a culture of continual optimisation today creates learnings as the number of customer assets to optimize grow. 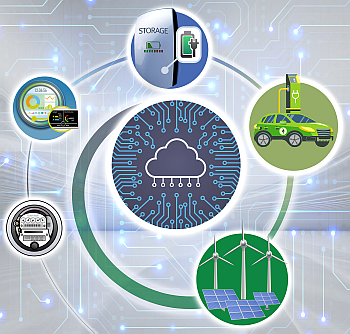 In a future world of customer side generation, storage, electric vehicles, controls for such as heating, cooling and lighting , there will be growing opportunity but also the risk of lagging behind the pace of innovation that customers seek. At that stage reputational risk of poor service, being perceived by their community to do the wrong thing or security breaches can undo all the technology optimisation causing a loss of customers and a sub-optimal business position. Moving beyond a continuously customer switch based market into one of retention and enduring beneficial value means that attention on customer perception must be constant, responses quicker and corrective actions definitive in resolving issues. Companies who create a trusted brand that customers choose proactively will have some resilience to shocks as those adopters will not want to undo the mental affinity their choice was based on. But all businesses will carry more and faster risk in a fluid market that is less predictable. Energy is evolving towards a new ‘survival of the fittest’ model, where those who can deploy finance, expertise, focus, systems and data insight to drive the optimal position of the business constantly will win. Those who cannot will find themselves out-competed as the markets speed up and agile decisions about aggregations of small volumes out maneuver their larger, more inflexible assets in their competitors. Energy Suppliers have access to a growing portfolio of micro-energy assets within the customer premise to aggregate and share benefits through optimisation. At the same time as companies focus on continual business optimisation they also face huge demands to embrace change. Change is coming from three directions all at once: technology, customers and government regulators. Global entrepreneurial technology firms do not try to change the core of the sector as it takes too long and is too complex. They are impatient to connect with customers, create a new relationship and encroach from there inwards towards the industry systems and processes. Customers are faster to choose and change than infrastructure and markets, so these entrepreneurs influence policy to adopt these new popular propositions and turn this into regulatory programmes. Smart, connected technology can revitalize energy markets before or at their peak plateau stage but they introduce new risks for participants in the market. An ability to embrace industry change proactively & turn it to customer benefit is core to future competiveness. Our new Smarter Energy Insights Forum gives a space to hear first-hand about UK energy market change. In UK our industry roadmap starts with smart meters and exploration of flexible grids. It then proceeds with faster switching, half hourly settlement towards embracing new technologies of storage and electric vehicles. In parallel our regulator is intervening to drive customer benefit from the market through the CMA remedies including collective switches, licencing review and an interim price cap. The market continues onwards with high levels of switching and a trend of customers adopting independent Suppliers that is changing the market share quickly. Suppliers have an amazing opportunity to secure customers, but only if they can create a viable long term business, embrace the benefits of industry change and create the next basis of energy supply. But not all market participants can win, where companies grow their market share this is at the expense of others. To continue as a net winner, the business needs the right decisions, controls and pace. With a greater need to optimize performance to ensure continued competitiveness and business viability, energy Suppliers face a changing market landscape. The basis of optimisation itself is changing with more devices creating more data unlocking faster competitive decision making. Peers may outcompete a Supplier for market advantage, capital or customers. Those who optimize liberate cash and expertise to refocus on customer innovation. That innovation will include sharing benefits back to customers financially as savings on their total energy cost. Beyond price and service, this is the frontier of differentiation – to find new ways that return savings to the customer by turning complex technology into simple services. All energy competitors are now potentially unicorns growing and shrinking quickly. They have an opportunity to break the cycle & create enduring value beyond the initial growth stage. Perhaps in this world of faster change, all businesses are now unicorns, able to grow quickly but equally decline with the same rapid pace. Forecasting is more volatile as customers respond to price signals and the generation mix becomes more intermittent. Planning is challenging when regulators intervene in markets before the outcomes of precious policies have matured. Market prices move faster than infrastructure and assets can be deployed. In UK the forthcoming changes to energy balancing and half hourly settlement may establish a wider spread of imbalance pricing, with high costs for differences in a participant’s supply and demand. Energy suppliers cannot be only a recipient of these changes if they seek to endure. Enduring businesses can engineer their operations and optimize to break this unicorn cycle and create long term competitive value they can afford that evolves in line with and just ahead of their customers. The current model of energy competition is ending; the next phase is being formed today. Now is the time to optimise and mobilise before it becomes expected by customers. Together, we are already delivering the next wave of competitive energy. 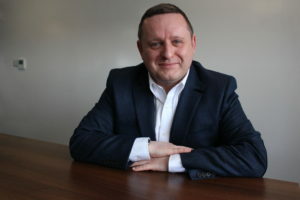 Mark engages extensively with competitive energy leaders globally to drive new insight and apply this to the platform enablement by Utiligroup and the wider ESG. Through 2018 he has been engaging with a range of innovators in UK and globally to explore how energy competition moves to the next era at scale. Utiligroup and its growing range of customers and eco-system partners are working collaboratively to create new competitive innovation at scale in the digital era. Contact Mark or join us at any of the events mentioned below by email at mark.coyle@utiligroup.com. 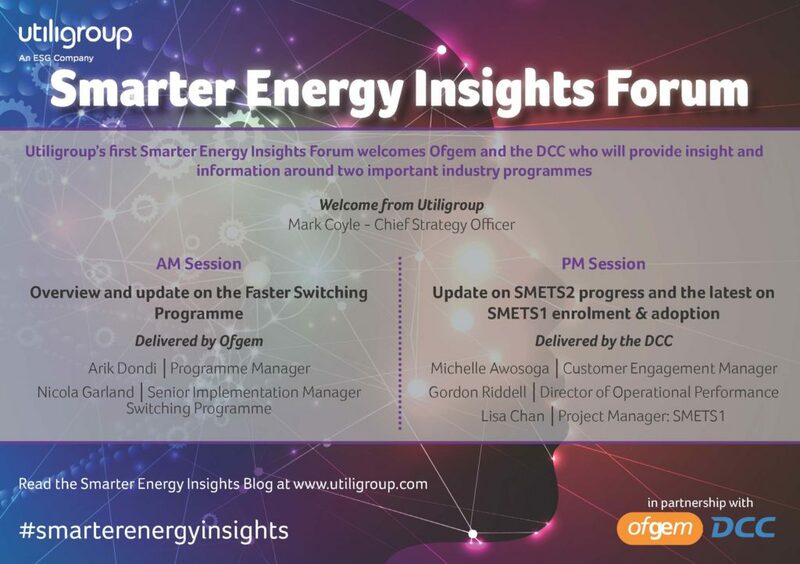 On 8th October 2018, Mark hosts our first Smarter Energy Insights Forum in Birmingham, UK with key sector change leaders sharing industry change roadmaps to nearly one hundred attendees. 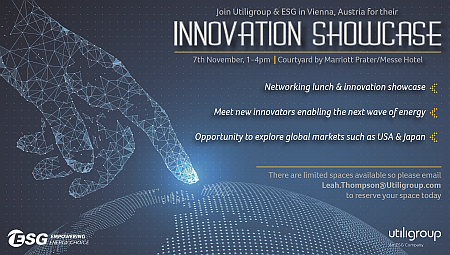 Utiligroup will hold the forum three to four times a year for its customers and partners to hear the latest on all the new industry change and technology trends. If you are a customer, partner or associate of Utiligroup please do contact Mark to attend. 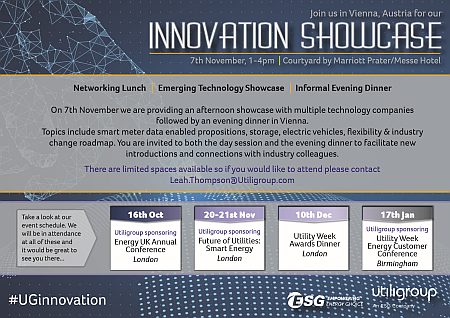 Mark will be hosting our Smarter Energy Insights – Innovation Showcase during European Utility Week, Vienna on 7th November 2018. Our session has a networking lunch and small introduction to a range of complementary innovators, with an informal Swiss dinner later on.